AutoZone, Advance Auto Parts, and O'Reilly Automotive, combined, account for over 14,000 retail automotive locations in the U.S. Despite beating expectations and trading near its all-time highs, AutoZone is still very much a growth story and can go a lot higher in share price. AutoZone (NYSE:AZO), Advance Auto Parts (NYSE:AAP), and O'Reilly Automotive (NASDAQ:ORLY) combined account for over 14,000 of the automotive aftermarket and replacement parts retail locations in the United States. In contrast to many other retail segments during this harsh winter, automotive retailers have largely benefited. Extreme cold weather weakens batteries and thickens engine oil, which increases engine wear and causes customers to replace automotive parts more frequently. As a result, AutoZone's recent earnings announcement beat expectations. Even though AutoZone is currently trading over $540 per share and is not far off from its all-time highs set in February of 2014, there are several reasons why its shares can go much higher. In the second quarter of the 2014 fiscal year, AutoZone's net income soared 9.4% to $193 million as net sales increased 7.3% to $2 billion. Domestic same store sales increased 4.3% as the company saw double-digit earnings-per-share (EPS) growth for the 13th straight quarter. In contrast to both AutoZone and O'Reilly Automotive, Advance Auto Parts has struggled on earnings in recent quarters. Despite net sales increasing 6% to $1.4 billion in the fourth quarter of 2013, same store sales rose just 0.1%. For the year, however, the company saw a bigger decline in same store sales of 1.5% when compared to the 0.8% drop in 2012. AutoZone's forward price-to-earnings ratio (P/E) of 16.1 is currently lower than the 16.5 for Advance Auto Parts and the 21.0 for O'Reilly Automotive. Forward P/E is sometimes used to forecast future earnings potential, and in this case shows that the market is pricing AutoZone below its peers. Nevertheless, below are five reasons to remain optimistic of AutoZone's future. The average age of a used car in the U.S. is at an all-time high of 11.4 years . This is a significant jump from the 8.4 and 9.6 year averages, respectively, in 1995 and 2002. Furthermore, sales of used cars are expected to rise through 2016 while their prices decline giving greater incentive for consumers to buy used rather than new. What this means for automotive retail chains like AutoZone is more potential customers. AutoZone opened 28 new stores in the U.S. and 4 new stores in Mexico last quarter. In 2013, the company opened 195 net new stores overall. As AutoZone continues to expand, they will be able to grow their U.S. commercial-parts market share which is still just 2.5% today. AutoZone is still working on improving its commercial program. The program plays a separate role from the retail business and consists of prompt delivery of parts to repair and service stations nationwide. Just 3,595 stores, or 74%, of AutoZone's stores support the commercial program. During the conference call, management stated they see improvement areas to increase the average revenue per program which is still below several competitors. As stated previously, the severe winter weather has been huge positive for AutoZone. Even the earnings for Advance Auto Parts were bumped up slightly toward the end of their reported quarter as management stated that sales of batteries and wipers increased in December. However, it also goes the other way as well. A hot summer also affects batteries as excessive fluid evaporation can occur, which causes damage to the battery internals. This is in addition to cooling system related failures that often happen in hotter months. Do-it-yourself (DIY) trends continue to benefit the automotive aftermarket industry as DIY info on the web continues to become more readily available. A recent study showed that despite those people with an improved financial outlook, 79% still do their own auto repairs. As the average age of a used car increases, DIY trends may actually surge higher due to the economics involved. It makes little sense for someone to pay thousands to a mechanic to repair a car worth nearly that much, or possibly less, when you can try to repair it yourself for far less money while learning something in the process. Unlike many other retail industries, Amazon.com will continue to have little to no advantage regarding automotive replacement parts. One of the bigger obstacles is the shipping of flammable and hazardous materials, which describes many replaceable automotive components. Car batteries can be bought through Amazon.com, but they cannot be returned. The same issue arises with motor oil and other fluids. Places like AutoZone usually refund customers on old battery cores and dispose of old oil free of charge. The other big obstacle is the idea of waiting for parts to arrive. Most consumers don't repair car parts until one fails, leaving the car immobile. Therefore, it is unrealistic to expect these same consumers to wait on a part to arrive in the mail. It was once said that you could look at life through the driver's seat of a car. There is a reason why the windshield is much larger than the rearview mirror. The windshield is for looking ahead, while the rearview mirror is for looking behind you. 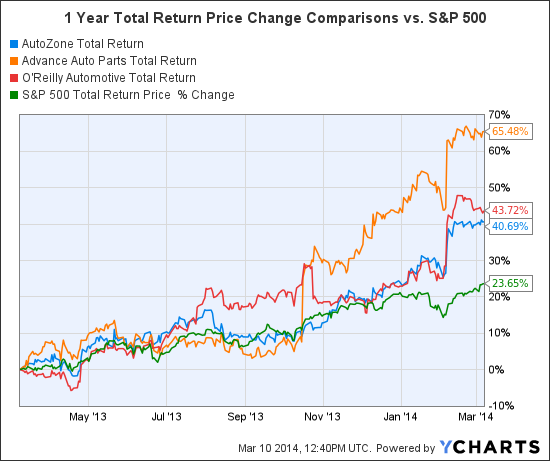 AutoZone's rearview mirror shows a huge success story in terms of business and share price. However, the windshield shows several opportunities for the company's stock to go much higher.